BlueHost is one of the oldest web hosting companies. It was founded in 2003 by Matt Heaton and since 2010 has been a subsidiary of the Endurance International Group. Headquartered in Provo, Utah, the company is led by the current CEO Mike Olson and offer hosting services to clients in the United States and several other countries. In 2013, the company introduced VPS and dedicated hosting as part of its service plans. BlueHost manages a user forum on its website where customers can post queries and reply to queries posted by other users. This offers an interactive platform to resolve technical issues. A ticketing service is also part of the customer service services of the company. Customers can post a query and the tech support team responds via email. There is a live chat service also where customers can interact directly with a customer support representative. In addition to these services, the website hosts training videos and free webinars that cover common topics related to customer concerns. While the company offers these channels of communication, the presence of a telephone helpline is also helpful. BlueHost has a single data center that is located in Provo, Utah, which is also the location of its headquarters. Maintaining a single data center for one of the largest web hosting companies is a risky idea because a problem with the data center can result in poor service for all the clients of the company. Nonetheless, the data center is well-maintained and adequate arrangements have been made to ensure the safety and security of the hardware and software resources. There are arrangements to keep the servers running at all times thanks to UPS and generators available on standby. BlueHost tools and applications are among the simplest to use, making tasks such as configuring the server and setting up the website manageable even for beginners. The monthly rates charged by BlueHost are among the most affordable in the market, making it an ideal choice for beginners. Customer service is of a good quality, which means support staff are available round the clock and response times are very quick. The company offers a very high level of uptime making it one of the most reliable web hosting companies around. BlueHost offers shared, WordPress, reseller, VPS and dedicated hosting packages. BlueHost’s shared hosting plans include Basic, Plus and Business Pro with monthly fees ranging from $3.45 to $6.95 Depending on the type of plan chosen, clients get 50GB to unlimited website space, unlimited bandwidth, and 100MB to umlimited email storage. BlueHost’s VPS hosting plans include Standard, Enhanced, Premium and Ultimate with monthly fees ranging from $14.99 to $59.99. Depending on the type of plan chosen, clients get 2GB to 8GB RAM, 30GB SAN to 240GB SAN storage space, and 1TB to 4TB bandwidth space. BlueHost’s dedicated hosting plans include Standard, Enhanced, and Premium with monthly fees for the first month ranging from $74.99 to $124.99. Depending on the type of plan chosen, clients get 4GB to 16GB RAM, 3 to 5 IP addresses, and 5TB to 15TB bandwidth space. Reseller hosting packages are offered as part of the Reseller Club with monthly rates beginning from $2.49. BlueHost guarantees to offer the best possible uptime but also acknowledges the possibility of downtime in its promise to clients. Downtime is likely to occur due to problems in directing server traffic, hardware problems and varying levels of server activity. Although BlueHost does not guarantee a specific level of uptime, its actual performance with regard to uptime is unreliable. On good days uptime can go up to 99.99% but clients have also complained of significantly lower uptime levels. BlueHost servers only have the capacity to host Linux websites. Some issues with customer service have been reported. BlueHost coupons include discounts as well as gifts for holders. From specially reduced rates on hosting plans to free domains and websites, these coupons offer something for everybody. BlueHost coupon discounts go up to 70% on all types of hosting services. In 2015, BlueHost was placed second for the Best Reseller Hosting Award by HostReview. 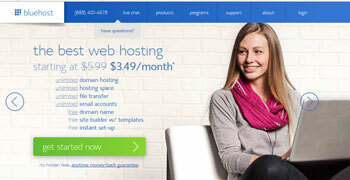 In January 2013, the company was ranked first for the Best Affordable Hosting by HostReview. In 2006, BlueHost was named the Best Web Hosting Company and Best Budget Hosting company by HostReview.